Bill Murray has come a long way. His corner office is all black lacquer and polished chrome, a monument to late-80s decadence, a temple whose sole object of worship is money. His bar—stocked with Stolichnaya and Tab by the case. His bathroom—complete with a stationary bike the size of a copy machine. His desk—a monolith worthy of Stanley Kubrick himself. He is no longer the scared little boy begging for his mother, sitting in the glow of the television on Christmas Eve as his father berates him and tosses him his sole present—five pounds of veal wrapped in butcher paper. No. That’s not him. He has everything he wants. He has everything he has ever dreamed of. So why is he miserable? As he sits in his office, knocking back Stoli and Tab after Stoli and Tab, he realizes that something is off. And it’s not the taste of the Nutrisweet. Something is coming. A knock on the door becomes a thumping, becomes a pounding, becomes a hammering, becomes an explosion. When the dust clears, the outline of a ghost from his past begins to take form. His old boss, the man he always wanted to be, now reduced to cobwebs and rotten meat. The man he has become. You know the story. It’s a classic: His old business partner wants him to change his ways, to love his fellow human. But he’s not having any of it, Francis Xavier Cross (this is the overbearingly Catholic name the screenwriters have given him). He reaches into his drawer, pulls out a gun, and begins to fire. As he stands there, perforating his oldest friend with bullets, he is fighting a losing battle. Not the least because he is dealing with a ghost. The bullets pass right through him. Or maybe they are absorbed somewhere deep within, molten lead glowing with warmth at the core of a body otherwise cold. “I don’t mind you shooting me, Frank, but take it easy on the Bacardi,” the ghost says, and as he takes a long sip, geysers of brown liquor pour out of the fresh holes in his chest. He can’t hurt the ghost. He can’t hurt this vision from his past. The truth is, he doesn’t want to. He’s not firing the gun at a dusty corpse leaking rum. He’s firing at himself. The first ghost takes Frank back to his childhood home—we see him in front of the TV, watching his father’s Christmas veal plop wetly onto the carpet. This is his origin story, the birth of his greed. The moment he realized he had to get ahead at all costs. At least, that’s the story he tells himself. But the ghost has something else in mind. He doesn’t want Frank to think about his father. He wants him to think about his mother. His poor mother, blowing him a kiss, wishing him a Merry Christmas, calling him an angel, unable to offer him better than that in spite of her love. My mother, raising three young boys more or less on her own, gave us wonderful Christmases. Every year we’d shuffle out in our pajamas to the living room, where piles of red and green packages had sprouted in the night like mushrooms after a heavy rain. X-Men, G.I. Joes, Ninja Turtles—the exact presents are not as memorable as the feeling that we had, this feeling that we were getting just what we’d wished for, just what we’d wanted. It was years before I would look back and wonder how my mother, who dropped out of college and worked as a loan processor for a small mortgage lender, had been able to afford such a bounty of licensed, name-brand merchandise. The answer, as it turned out, was that she couldn’t. Not really. There were plenty of signs. I’d pick them up along the way and put them back down, not sure what I was looking at. The men who would call day after day, asking to speak to my mother, their demeanor professional but mildly threatening. The notice of eviction I found on the door of our apartment one day, which my mother quickly snatched when she got home, telling me not to worry. The concerns about food—how panicked she would sound if we finished a box of something too soon before the end of the week. As an adult, I would learn that my mother had to file for bankruptcy, that she had owed huge amounts of money to the IRS. This didn’t surprise me or upset me. Rather, it comforted me. I’ve had many of these problems myself, in adulthood. It made me feel safe, knowing how many obstacles my mother and I had shared. She came through. She made it to the other side. She kept going. Bobcat Goldthwait has seen better days. All it took was one wrong move, and now he’s found himself on the street, his possessions in a box, his only Christmas gift a bottle wrapped in a paper sack. Goldthwait’s trademark cadence precludes us from taking him all that seriously—that low growl whose pitch builds until it breaks its back on a quavering screech. There are other, more sympathetic images of poverty in Scrooged: the homeless man who freezes to death, forcing Frank Cross to take a hard look at his choices; Alfre Woodard, Frank’s assistant, whose family struggles to keep afloat even as Cross refuses to give her a Christmas bonus. Goldthwait is different. He’s the only one who gives in to despair, to anger. In the last act of the film, he returns to the office with a shotgun, stalking Cross among the cubicles—a twisted, drop panel ceiling safari. Just before Thanksgiving of 2014, I was laid off. For over a year, I’d been working as an editor for a company 3,000 miles away. It was contract work, but it paid well, and it afforded me plenty of free time to write. I’d never really liked the job, so it surprised me a bit how absolutely crushed I was by the news. As soon as I got off the phone, I went straight to the bathroom, where I wept on the floor of the shower until the water went cold. I’d be out of work just in time for Christmas. A few weeks later, in December, I took a walk through the side streets of my neighborhood toward the Safeway, a midday diversion from sending out resumes and quivering with despair. Along the way, I do math in my head, calculating how long the money will last, trying to pinpoint the exact moment in the future when a temporary setback would become a life-crushing defeat. In that moment, suddenly, it was all too much. I choked on my own throat. I began to cry uncontrollably. All I could see was disaster. The end of everything. The idea that comes to me next comes slowly. An idle consideration, at first. But those of us who’ve had this particular idea know that an idle consideration can soon snowball into certainty. Not so much a determination to take action as an inability to see any other way out. The only solution, it’s obvious, is to kill myself. The last time I wanted to kill myself was also around Christmas, and it was also about money. It was the week after New Year’s 2013, and the new insurance year had begun. A reset in the deductible and a hike in copays led to an unexpected bill at the pharmacy for the asthma medication I take daily. According to the pharmacist at my local Target, it would cost me $245 dollars a month to keep breathing. I staggered to a nearby Starbucks with my laptop, where I searched for prescription discount programs and answered a few emails related to the upcoming semester of graduate school (my last). As I sat there stress-eating a Cranberry Bliss Bar, what felt like a realization began to dawn on me. There would never be any escape from this. As long as I lived I would be fighting as hard as I could to secure the most basic necessities. That’s what life is. The only way out, then, was to get out. It grew on me like a fungus as I wandered through the parking lot to the train station to head back home. Not a desire. Not an urge. An eventuality. A foregone conclusion. It was time to go. Bill Murray can’t contain his joy. He’s alive—something he has never stopped to appreciate before. What a miracle, the simple fact of his being here, walking, breathing. Only minutes before, he lay helplessly in a coffin, squirming and struggling and screaming to escape as it was slowly devoured in flames. And then he was here. Alive on this cold, inhospitable earth. He rushes down to the television station, where the live production of Scrooge that has served as the backdrop for the film is reaching its heartwarming conclusion. The TV Scrooge tosses a coin from his window for the boy to buy the biggest goose in the butcher’s shop (which, thanks to early Industrial Revolution labor practices, is open on Christmas Day). 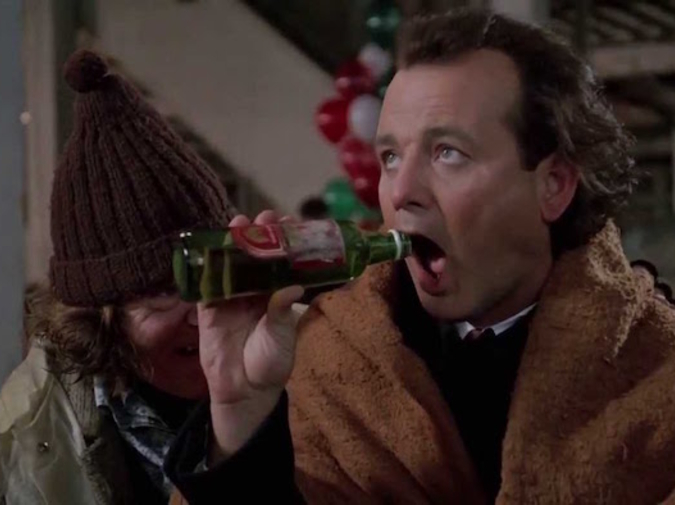 But Bill Murray is there first, to catch the coin, to interrupt the broadcast with a sincere but rambling tribute to the power of Christmas, to the potential for love and hope even in the darkest of times. “We’re gonna need champagne for 250 people, and send the stuff that you send to me, don’t send the stuff that I send to other people,” he says, as the cast and crew and executives look on, dumbstruck at this miserable man’s transformation. And then he begins to sing—an old Jackie DeShannon song—and the cast, the audience, the viewers at home, begin to sing along. And then a funny thing happens. All along, Murray has been speaking directly into the television cameras. But suddenly, as the choir of bystanders sways and hums behind him, he starts talking to us. He breaks the fourth wall. It’s as if he is so full of joy that the tidy confines of this fictional world cannot contain him. He has to reach outside of it. He has a message for us. He asks us to sing. He asks us to reach inside ourselves for that deep reservoir of hope that the world spends so much time trying to crush. It’s in there. He knows it. And as he asks us to find it, the credits start to roll. It’s Christmas again, and slowly but surely, I’m digging my way out. Not of the money problems—I’ve got enough debt to last me a lifetime. Money comes and goes. Mostly, it goes. That’s fine. It’s not about the money. The money is just a way to measure pain. For so long, all I wanted was a way out. Enough money that I wouldn’t have to struggle. Enough comfort that I wouldn’t have to want for anything. Enough security that I wouldn’t have to be afraid. When would I get my happy ending? When could I stop? When could I rest? I’ve finally lived enough life to realize the answer to those questions is never. There is no magical point when all your problems go away. There is no fade out to the ending credits as the music swells. There is no way out. There never was. There’s only a way in. All you can do is keep going until it hurts just a little less, and if it starts hurting a little more instead, you have to keep going farther. That’s what my mother did. That’s how she made Christmas beautiful for me and my brothers in the middle of bankruptcy, with IRS statements piling up on the kitchen counter. Look at yourself. Who are you? Who do you have with you? What would you do to keep them? That’s where you start. There is no ghost. Put down the gun. The only one you’re fighting is yourself. Matt Sailor was born in Lansing, Michigan, and moved to Atlanta, Georgia as a child. Today, he lives in Portland, Oregon. He has an MFA from Georgia State University. He is an associate editor at NANO Fiction and the fiction editor of The Mondegreen. His fiction and essays have appeared in PANK, Paper Darts, Necessary Fiction, Bring the Noise: The Best Pop Culture Essays from Barrelhouse, and elsewhere. His website is mattsailor.com. His favorite drink is bourbon in a wide-bottomed glass.